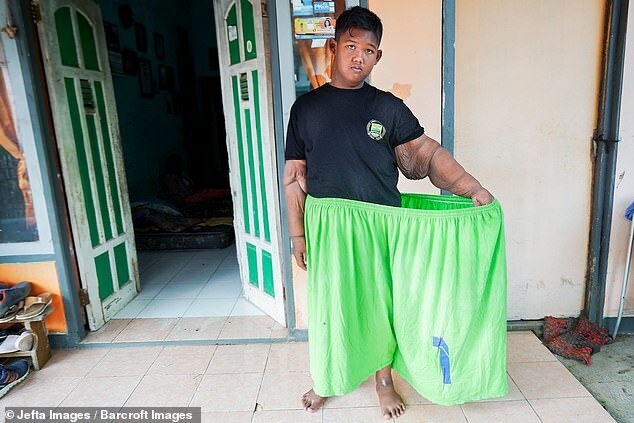 A 13-year-old boy who once weighed an astonishing 423lbs (191.9kg) is set to have his excess skin removed after losing more than half his body weight. 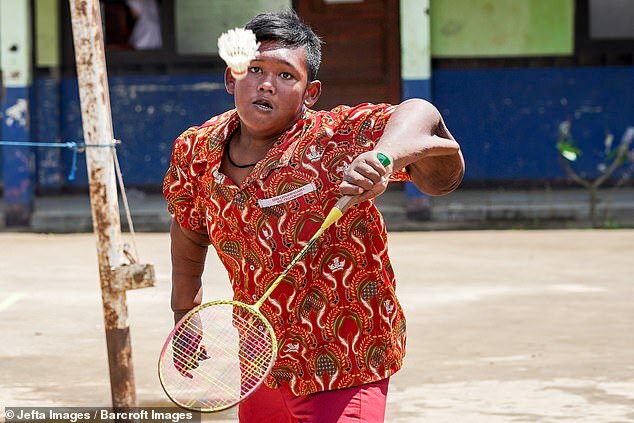 Arya Permana, of Indonesia, was once considered the heaviest child in the world thanks to his diet of instant noodles, fizzy drinks and deep-fried chicken. At just ten years old the youngster was barely able to walk, had to be home schooled and was forced to bathe in an outdoor pond. 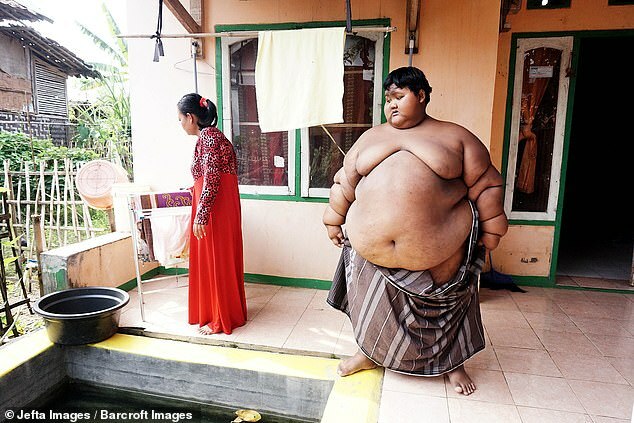 With his size putting his life at risk, Arya reportedly became the youngest person ever to undergo a gastric-sleeve operation. The procedure - along with a strict diet of grilled fish and vegetables - helped the teenager lose a remarkable 234lbs (106kg), with him now weighing 189lbs (85.8kg). A surgeon has offered to remove the excess skin from Arya's chest and arms after his upcoming exams. Arya's size peaked when he was just ten years old and weighed the same as six boys his age. 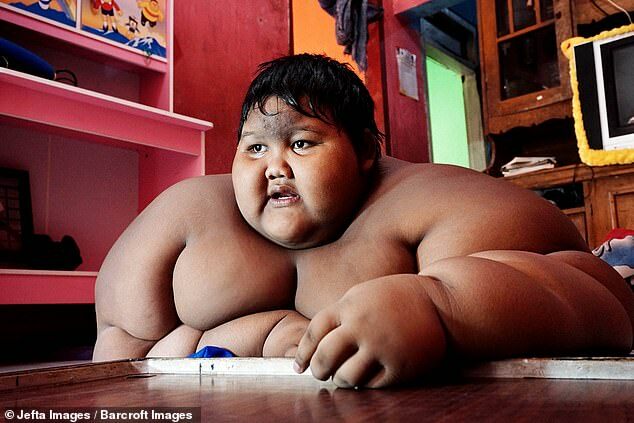 His parents tried to encourage their son to eat healthier, but admit they gave in to his demands for fattening foods. Arya's father Ade Somantri said: 'Back in the day since Arya was five-years-old and already getting big I can say, "Yes I spoiled him". Arya - who longed to be thin - would eat five meals a day, with two large plates per sitting. This eventually led to him being so morbidly obese he struggled to walk just five metres without getting out of breath. Arya's parents were initially reluctant to let their son go under the knife, but realised they were putting his life at risk by stopping him having the surgery. 'At the beginning we didn't want to do the surgery to Arya,' said his father, who lives in Karawang, West Java. 'Finally, the doctor showed us the procedure from the videos. The doctor showed the types of equipment and they will open [the skin] just 1cm. Arya had the five-hour bariatric surgery at the Omni Hospital in Jakarta. Just one month later, he had lost nearly 70lbs and the weight continued to drop off. But Arya was not thrilled with the lifestyle changes that came with his transformation. 'At first Arya was very annoyed and upset because he loved eating but after the gastric bypass surgery, automatically if he ate a lot he will vomit,' his father said. Since the gastric bypass, just seven spoons of food is enough to fill Arya up. 'Back then, yeah I would like to eat instant noodles but now I can't and I got used to it so I don't want it,' he said. Arya now exists on a healthy diet of grilled fish, vegetables, soup and fruit. This helped him lose enough weight to manage the 1km (0.6mile) walk to school every day, with him also having the energy to play and swim with his classmates. And the pond he used to bathe in has been overtaken by plants. Arya - who hopes to one day be a footballer - said: 'I am happier now. 'Because now I can play football, hang out with friends, play around, go to the river. Arya's parents have also noticed their son is in a happier place. 'His attitude looks calm, more cheerful and with his body weight now he can play football or volleyball with his friends, sometimes join with the friends for jogging in the morning,' his father said. 'From what I observed about his mental state, he is more confident. 'Before if he wanted to come with his friends, he feels not confident because he has to walk quite far and was not strong enough. But for all the ways his life has improved, Arya's weight loss has resulted in a large amount of excess skin on his arms and chest. The teenager is hoping to have skin-removal surgery at the Hasan Sadikin Hospital in Bandung after completing the national exams. 'Even though he does exercise, playing football and badminton and his body is already strong, the loose skin is hanging down and it must be removed,' his father said.